Platforms at train stations are often very crowded – especially during rush hour. 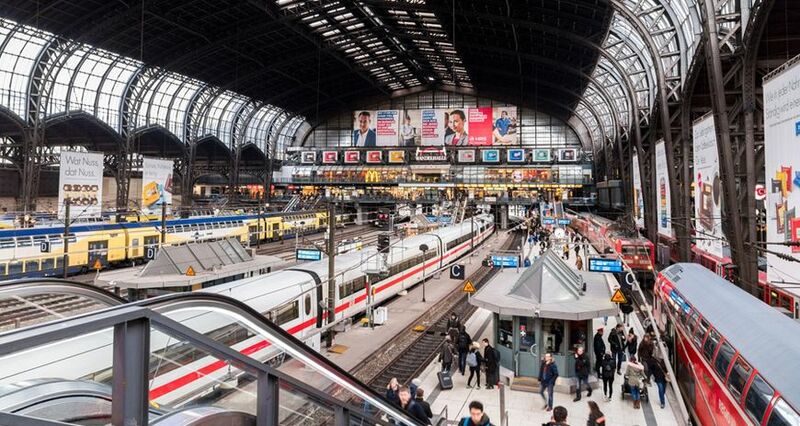 Hamburg’s main station has had to close its doors on occasion to ensure that passengers remain safe when getting on and off the trains. Researcher Maik Boltes and his team want to improve situations like these by seeking effective ways to manage crowds of people. As the train enters the station, the people waiting on the platform begin to move as if prompted by a signal. They walk casually at first, then more briskly. People push and shove from the back, but the crowd comes to a stop at the closed doors of the carriage. It has to, because it can’t move any further forward – the only option is down. Someone stumbles and falls. This scenario reflects exactly what could happen on any given day in Germany’s train stations. “Everyone pushes toward the doors of the train, and this dynamic results in high densities of people,” says Maik Boltes, who heads up the department of Pedestrian Dynamics – Empiricism at Forschungszentrum Jülich’s Institute for Civil Safety Research. “Passengers are prepared to push and shove because there are a limited number of seats available on the train. This increases their risk of falling from the platform onto the tracks.” Train stations and their platforms are absolutely packed with crowds of passengers during large events in particular, but also at rush hour every day. There are many reasons for this: Train stations are often older buildings located in the heart of the city. This is practical, because it makes them easily accessible. But it also means there is no room to build additional tracks. Plus, more and more people are traveling all the time. In Germany, some 36 million individuals travel on public transport every day. And passenger numbers continue to rise, increasing by 8 percent for local public transport from 2006 to 2017 and by around 2 percent for Deutsche Bahn, Germany’s federal railway system. In other words, something needs to change to ensure that the crowds of passengers can reach their destinations without incident in the future as well. Germany’s Federal Ministry of Education and Research has addressed this issue by awarding research funding in the amount of 2.1 million euros – with the goal of making train stations safer. The large-scale “CroMa” (Crowd Management in Transport Infrastructures) project was launched on August 1, 2018, and covers a research period of three years. In addition to the Institute at Forschungszentrum Jülich, the University of Wuppertal and Ruhr-Universität Bochum are also participating in the project. Düsseldorf Congress GmbH is a project partner too and, as a conference organizer, has a significant interest in safe approaches for managing crowds. The partners are joined by a long list of “associated partners” to the project, including operators such as Deutsche Bahn, Swiss railway firm Schweizerische Bundesbahnen AG, and the city of Cologne’s municipal transport company, Kölner Verkehrs-Betriebe. At the same time, he says that the principles and norms of the way people behave are learned unconsciously. “People react automatically. We’re interested in questions such as, when do I break the social rules? When do I push into a line from the side? What motivates me to wait in a tightly packed line?” asks Boltes. He says that putting up with the cramped feeling of being in a crowd plays a key role. The more people have to stand together – and the tighter the conditions – the sooner they feel uncomfortable. But according to Boltes, it’s not a sense of panic that then determines the way they act. On the contrary, “It’s rational. Those who call for help in that situation or push to free themselves from the crowd simply want to survive,” he says. “Our goal is to prevent such situations from arising in the first place,” says Boltes. To this end, the research institutes are collecting examples of best practice. While this may be a relatively new line of research, “crowd managers” and those who organize large events have already had to find safe ways of directing crowds across festival sites for many years. They have developed promising ideas in the process, and these concepts will soon be put to the test by science. Field studies are also being carried out at train stations in Germany and Switzerland, where systems that track walking routes have already been installed in some cases. These systems work around the clock to identify dangerous areas without collecting image material – in other words, anonymously. The project team is using all of this data, walking route analyses over several weeks, field studies, and best practice concepts to devise lab experiments. Among other things, they want to use these experiments to determine how train stations and their platforms could be built to manage the flow of pedestrians without a control system of fences. So the key question is: What role do social norms and action strategies actually play for the subjects when they are moving through a train station and onto their train in a crowd of people? The researchers are especially eager to answer this question, because they are measuring skin conductance and heart rate – an indicator of stress levels – as part of pedestrian experiments for the first time. The team is following up these experiments with questionnaires that determine what conditions are acceptable to the subjects: When do people feel they have been treated unfairly in crowds? At what point do conditions become too cramped? When is the situation unbearable? The significance of loudspeaker announcements is something the team is already aware of from earlier experiments and would like to examine further: “Selecting the right announcements can motivate people to behave more safely.” In other words, Boltes says, the psychological effect prompted by a loudspeaker announcement could presumably be a decisive success factor. Helmholtz has a new member. We spoke to Michael Backes, the director of the Helmholtz Center for Information Security, about computer viruses, autonomous driving, patient data—and how to attract employees from Silicon Valley to the state of Saarland in southwestern Germany. Could job interviews be replaced by a simple brain scan? This just might be possible someday thanks to the methods neuroscientists at Forschungszentrum Jülich are developing. But it’s more likely that they will enable early diagnosis of depression and dementia. Computer scientist Ali Sunyaev believes that blockchain technology is set to change our society just as much as the Internet has in recent decades. At the Helmholtz Horizons Symposium, he also shared his insights on what this means for science. For the ELiSE Procedure, the group of scientists and engineers led by Christian Hamm take nature as their model to create building components in an entirely new manner. Research scientists at the Karlsruhe Institute of Technology (KIT) hold a remarkable record: They succeeded in transmitting data at a rate of 100 gigabit per second.